Just unveiled and running through September 30, the Blackhawk Automotive Museum in Danville, California, offers what figures to be one of the most talked-about exhibitions of the year. Featuring about two dozen stunningly designed automobiles, the exhibition is based on the book, Stile Transatlantico / Transatlantic Style, by author Donald Osborne and photographer Michael Furman. The book’s focus is on mid-century art and design, Italian culture and automobiles. Plymouth Belmont, Chrysler GS-1 coupe, Alfa Romeo 1900 CSS Ghia coupe, Hudson Italia, Lancia Aurelia B24 Spider America, the Ghia Streamline X “Gilda,” Chrysler 300F convertible, Lancia Flaminia Pinin Farina coupe, Maserati 5000GT touring coupe and Cadillac Eldorado Brougham Pinin Farina. The exhibition coincides with the museum’s 30th anniversary. “Transatlantic Style: A Romance of Fins and Chrome offers to the American public their first-ever opportunity to walk through history, viewing a select gathering of iconic, jet-age cars together in one setting to really understand the impact these cars have had,” the museum’s news release added. The Oklahoma History Center isn’t a car museum, but through mid-August it is showcasing 22 “unique and, in some cases, one-of-a-kind automobiles” from the private collections of several Oklahoma car collectors. “The Art of Speed: Oklahomans and Fast Cars” is the title of the showcase, which includes cars dating to 1900. The Seal Cove Auto Museum in Maine will stage its annual murder mystery/dinner event July 23, and will join the nearby Jesup Memorial Library for “The Plot Thickens,” a preview featuring some of the cast members and their back stories on the evening of July 16. For information and tickets, visit the museum’s website. 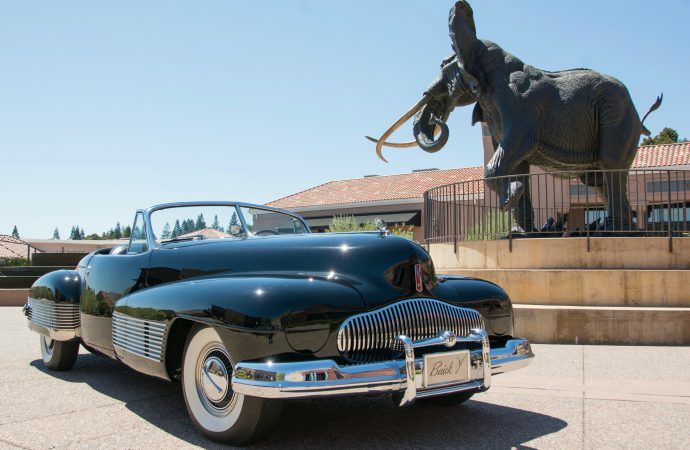 Elsewhere, Le May — America’s Car Museum, plans a Cars & Cigars program July 28 at Tacoma, Washington, and the Barnstormers Ball: Gin & Jazz is on the calendar for August 26 at the Owls Head Transportation Museum in Maine. Not only will the Auburn Cord Duesenberg Automobile Museum in northeastern Indiana provide free coffee and donuts at its Saturday morning cruise-in this weekend, but Praxis Detailing of Auburn, Indian, will send one car home with a complete detailing kit. The museum also hosts two more of its annual Children’s Summer Camp Activity Days, July 19 and 23,, from 10 a.m. until 3 p.m., with campers “fully immersed in the Auburn Cord Duesenberg Automobile Museum and its history through hands-on activities, presentations, and interaction with artifacts,” the museum notes. The camps are geared to the 10-12 age group. For information, visit the museum website. Bonhams appraiser and collector car consultant Gregory Porter will be at the Simeone Foundation Automotive Museum in Philadelphia during its next Demo Day event, July 22. In conjunction with Bonhams’ annual “Preserving the Automobile” auction, scheduled to be held at the museum on October 2, Porter will provide complimentary vintage vehicle appraisals to car owners considering offering their vehicles in that sale. The July 22 Demo Day feature is Ford v. Chevy. The Simeone also offers free admission for teachers during summer months (through September 4). In addition to touring the museum’s collections, teachers can obtain materials they can use in classes regarding the automobile and 20th century society. For details, see the museum’s website. Planning continues for the National Corvette Museum’s 23rd anniversary celebration and Hall of Fame induction ceremonies, scheduled for August 31-September 2 in Bowling Green, Kentucky. For the events calendar and registration information, visit the museum’s website. The museum also has announced the opening of the NCM Kartplex at the motorsports park just across the interstate from the museum. The cost is $20 for an 8-minute session and participants must be at least 60 inches tall or have a valid driver’s license. Edd China, late of the popular Wheeler Dealers television series, will drive two of his crazy creations around the grounds of the National Motor Museum in England on July 23. China plans to showcase his road-legal sofa and the Bog Standard, a complete bathroom suite — driver sits on the toilet seat while passenger reclines in the bathtub sidecar — that is taxed, insured and street-legal. The laps around the facility will be part of the Wacky Record Breakers exhibition taking place inside the museum. The exhibition runs through August 31 and shows the “crazier side” of motoring through vehicles such as Fast Asleep, a double bed capable to driving at England’s national speed limit, Gone to Speed, a garden shed that can be driven at nearly 60 mph, and a dodgem car that The Stig once drove at more than 100 miles per hour on Top Gear. Nearly 300 vehicles, including Mk 1 and Mk II sedans, V12 E-types, XKs and a few luxurious Daimlers turned out for the second Simply Jaguar gathering July 9 at the National Motor Museum in Beaulieu, England. Among those showing vehicles was Clint Watson, a “serial Jaguar owner” who currently has 22 examples of the breed and whose Lynx Jaguar D-type was voted the People’s Choice award at the show. 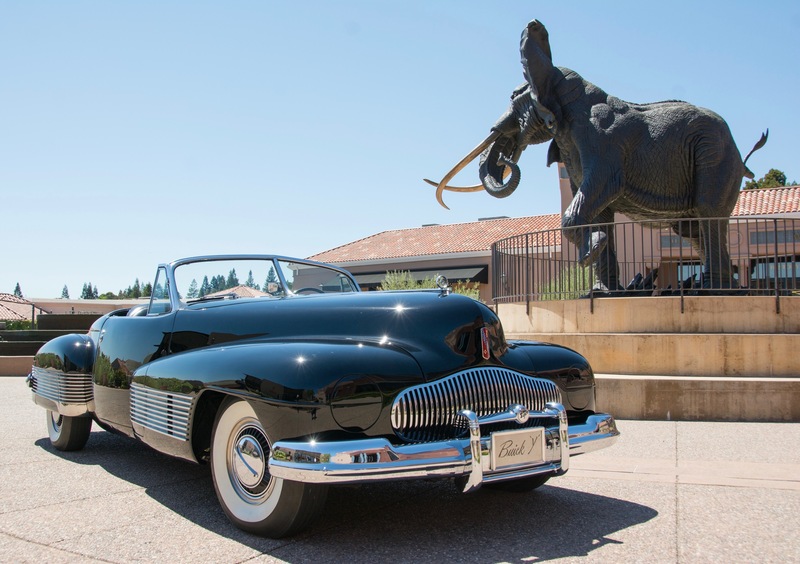 The museum plans its third annual Simply Jaguar event for July 8, 2018. Next up on the “Simply” series is Simply Japanese, scheduled for July 30. The Kansas City Automotive Museum stages its People’s Choice Car Show this Saturday at the Carriage House of Johnson County in DeSoto, Kansas. On July 30, the museum stages its inaugural The Great Car Show in conjunction with the National World War I Museum and Memorial at 2 Memorial Drive in KC, Missouri. For details on the Great show, see the special website. Vault tours are a big draw at the Petersen Automotive Museum, and the AACA Museum in Hershey, Pennsylvania, is getting into the act as well. On July 22, the museum is staging a Caffeine Behind the Scenes car show that will include the typical cruise-in outside, but also a tour inside of vehicles currently not on view in the museum’s galleries. For details, see the website.